VNRE – Knight Frank Vietnam on November 30 officially opened the Property Center at 40 Phan Boi Chau – Hanoi, the first international business concept in real estate sector in Vietnam. 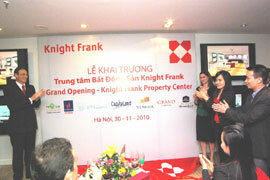 The Knight Frank Property Center is the “One Stop Shop‟ for anyone in Hanoi looking to view properties for sale. There will be an exciting menu of developments from across the country in 200 square meters of exhibition area. Exclusive advisory services from the professionally trained Knight Frank team will offer customers a selection of properties which exactly meets their needs. All available spaces at the Knight Frank Property Center are now filled with qualified developers prior to the opening date which indicates a bright future for this kind of business concept in Vietnam. Foundation members of the Knight Frank Property Center are Indochina Land, CapitaLand, Grand Capital, PVC Hong Ha, Venesia, Nova Land, and Havana, just to name some. The Knight Frank Property Centre will also provide all agents in Hanoi with a five star work environment where they can bring their clients, show off exciting projects for sale, know the Knight Frank specialist project sales team will look after them and their clients and be well paid for any purchases their clients may make. The current texture of the mid to high end residential market in Vietnam is relatively soft in comparison to say 2005 to 2008. That is not to say sales are not occurring but it does suggest a buyers’ market. Much of this is driven by macro-economic events of the last two years especially the global financial crisis. However, there is always GOOD NEWS, because in a buyers’ market, it can be said that prices will never be better than they are today. With this in mind, those wanting to secure wealth through real estate need to be buying now before demand exceeds supply and prices start to rise rapidly again. An improving market can be evidenced by recent one day sales events where over US$ 8.5 millions of residential property were sold by Knight Frank. The projects included Mulberry Lane (CapitaLand), Indochina Plaza Hanoi (Indochina Land) and Fusion Alya, said Mr. Lightfoot. The Property Center concept is long overdue in Vietnam. The Vietnamese property buyers are becoming far more educated and experienced. Their tastes are changing as are their shopping expectations when looking for property. The Property Center concept delivers convenience and saves time for the buyers. With a professionally trained sales team Knight Frank brings a never before seen level of professionalism to the buying process. The presence of Knight Frank in Hanoi and Ho Chi Minh City has enchanced its strong network in the Asia Pacific Region. The company currently employs over seventy people with decades of property experience in Vietnam and internationally.